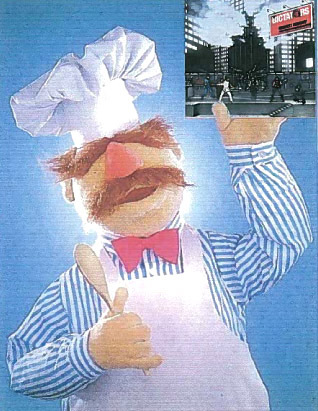 October of 1996 found the Dictators on their first and only tour of Sweden. With the possible exception of Spain, there is no other European country that has a greater appreciation for rock and roll than Sweden, and our boys spent a whirlwind 10 days supplying both in the land of the lutefisk. In between practical jokes pulled by their tour mates, the Hellacopters (“No kidding Manitoba, whale blubber behind your ears is a real-turn on to Oslo women!”) and participating in the Swedish National Pastime, which is making fun of the Finnish***, the band somehow found time to play 9 dates with the Northern Lights as a backdrop. October 2, 1996, was the first date, at Geno’s in Stockholm. There’s an excellent video of this show that hasn’t shown up on YouTube yet, so you’ll have to take my word for it that our guys were firing on all cylinders. •	11. Science Gone Too Far! *** Q: Why do Finnish people never play hide and seek? A: Because nobody wants to look for them. Q: How many Finns does it take to change a light bulb? A: Five. One to hold the bulb, and four to drink enough vodka until the room starts spinning.